I like the 9.4 copy better, plus that 9.6 had a 2 1/2 inch hair stuck in the case across the Black Cat's leg that is not visible in the pic....it really, really bugged me! A hair actually sealed in the slab? Yup, a fairly long one to! No love for #194 folks? Like I said I know it isn't a big money book but does it have to be to be a good book? I got this in December. Thanks for particapating! 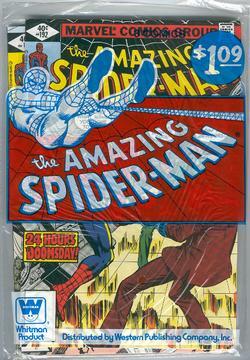 Lets go folks...I know many of you own a ASM #194. The book is worthy!! Ok, I have a copy but it's probably VF or so. I don't own this, but thought this was kind of neat. I saw the 9.9 at Heritage's booth at SD in 2009 or 2010...don't remember...it was nice. Nice, you don't often see higher-graded newsstand copies, especially as Whitman mass-produced 3-packs of the Diamond issues, which makes the populations even more skewed. Anybody own one of the 9.9 copies? Who owns them? I havent looked at it in a long time but it's probably 9.2ish i'd say. Back then, my dad would bribe me with comic books to go to the grocery with him to buy cigs. ASM 194 was one of the earliest books i remember getting on one of those cig runs. Got a few of them but only one is graded and I shall post a pic later once I get home. Love the Black Cat. Personally, I would like to see a CGC 9.9 Newsstand Edition, but I doubt one exists as those 9.9's are likely straight from Whitman multi-packs.